A dwagon is a non-humanoid flying Unit with a strong melee combat capacity (via teeth, claws and tail) as well as a ranged projectile (typically a breath weapon). A dwagon can be mounted by a rider,Erf-b1-p003 Erf-b1-p006 Erf-b1-p031 and can carry a passenger in addition.Erf-b1-p041 Erf-b1-p116 They are described as "big, scaly, flying lizards with lots of teeth and a bad attitude".Erf-b1-p026 They are only known to be popped at Gobwin Knob, but they also occur as a "wild" unit. Wild units pop randomly, with dwagons in the Minty Mountains popping with a probability of about 1 in 200 for any given hexErf-b1.5-p035 . Presumably wild dwagon can be seen flying in the distance on the very first page. Dwagons can be "plated" (armored, like horse barding). It is unclear how this is done: Fabrication, randomly when popped, a shmucker-costing upgrade, etc. It is also unknown whether it is a permanent or temporary upgrade, or if the plating can be moved from one dwagon to another, or whether it is in fact a natural shell which individual dwagons can grow upon reaching a certain level. Level three and above Cities of Gobwin Knob can Pop most types of dwagons.WoT-6051503 They take at least 4 turns to pop Erf-b1.5-p035 . As of now, no other types are known. Dwagons are incapable of carrying Heavy units as seen when Parson orders a yellow Dwagon to let him mount it only to fall slowly to the ground. 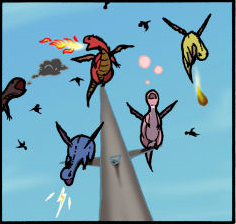 Dwagons are referred to as heavy fliers by Stanley in Book 3 Page 6. So far the only side known to use Dwagons is the Gobwin Knob faction led by Stanley the Tool, though it has been implied that there are other sides also capable of using them. It is repeatedly stated that he controls them through the use of the Arkenhammer. But they can be tamed without it as Jillian demonstrates by offering a feral one the bodies of several high elves to feed on. There are no more black / brown dragons in Erfworld. The story is that during a dramatic story moment in The Order of The Stick Elven mage Vaarsuvius cast an epic spell which wiped out a quarter of all black dragons... which included all of Erfworld's black dragons. Yes, the spell cast by Vaarsuvius was that powerful. For the purposes of printing the Erfworld books all black / brown dragons were Retconjured to purple. 1. ^ Balder, Rob. Erfworld - a knol by Robert Balder. http://knol.google.com/k/robert-balder/erfworld/23skug9txczm1/2 . This page was last edited on 6 February 2018, at 03:25.